Security of supply and improved network efficiency are key drivers in today's market, says Sean Ottewell. ABB has won an order worth US$110 million (EUR85 million) from Litgrid, Lithuania's state-owned electricity transmission system operator, to supply and install a high-voltage direct current (HVDC) converter station in the country. The 500MW back-to-back HVDC converter station will help connect the 330kV Lithuanian grid to the 400kV Polish grid, thereby integrating the electricity networks of the Baltic states with the continental European power grid and contributing to the development of an EU electricity market. At present, the Lithuanian electricity system is connected only with the grids of Latvia, Estonia and the countries to the east. The new link will also bolster the NordBalt HVDC connection with Sweden, which is currently under construction by ABB. "In addition to facilitating energy trading between Poland and Lithuania, this link will strengthen grid stability and security of power supply in the region," said Brice Koch, head of ABB's power systems division. "Our leading global track record in HVDC technology was pivotal in winning this order." 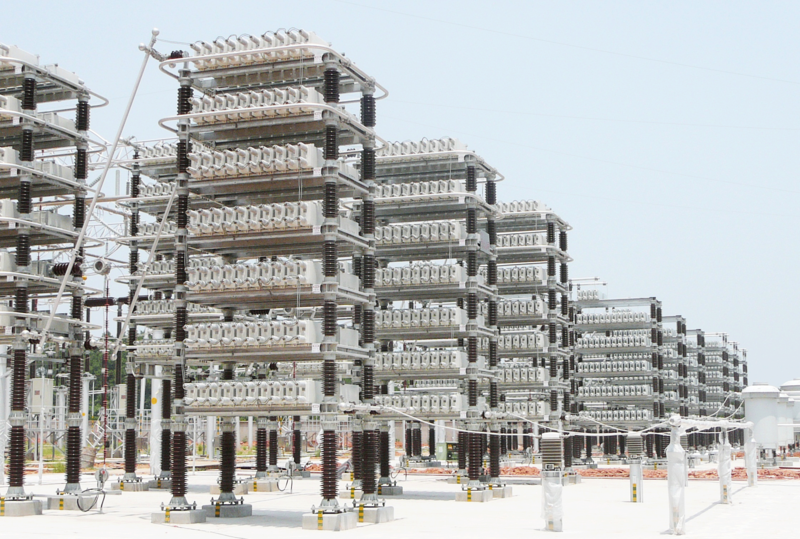 ABB will design, engineer, supply and install the converter station including high-voltage equipment such as power transformers and thyristor valves. The station will be built near the city of Alytus and is expected to be operational in 2015. A 160km-long 400kV AC overhead line will link the HVDC station in Alytus with a substation close to the city of Elk in Poland. ABB pioneered HVDC technology almost 60 years ago and has now completed more than 90 HVDC projects around the world with a total transmission capacity of more than 95,000MW (Fig.1). In Germany, TenneT and Mitsubishi Corporation have officially sealed their partnership with respect to two offshore high-voltage cable projects, BorWin1 and BorWin2. Mitsubishi's voting interest will be 49 per cent with aggregate maximum equity commitment of EUR240 million. At the same time both partners signed a contract for an investment in two more offshore projects named HelWin2 and DolWin2 in which Mitsubishi also will acquire a 49 per cent voting interest for a maximum equity investment of EUR336 million. The planned high-voltage cables, involving a total investment of EUR2.9 billion, will connect a number of offshore wind farms in the German North Sea to the onshore electricity grid and will have a combined total capacity of 2.8GW, representing close to 30 per cent of the total ambition of the German government for offshore wind in the North Sea. Mel Kroon, ceo of TenneT, said: "This is an important step for our long-term partnership with Mitsubishi Corporation. I am pleased that we managed to come to a final close shortly after the recent announcement of necessary improvements of the German Energy Law, which was enacted 1 January 2013. This is an excellent result of a constructive cooperation between our teams." Currently TenneT is operating two and working on eight further projects to connect wind farms in the German North Sea. These essential infrastructure projects total a transport capacity of 5.3 GW of renewable electricity, equivalent to the consumption of five million households. With these projects TenneT has committed almost EUR6 billion in offshore infrastructure. In terms of DC projects, these are: BorWin1 (400MW), BorWin2 (800MW), DolWin1 (800MW), DolWin2 (900MW), HelWin1 (576MW), HelWin2 (690MW), and SylWin1 (864MW). The other two projects - Nordergrunde (111 MW) and Riffgat (108MW) - are AC projects. On 26 February, Georgia's minister of energy and natural resources visited Akhaltsikhe substation and observed the progress of Black Sea Transmission Network project. This will eventually link Georgia and Turkey's networks. His visit highlights the importance of the power network to Georgia: it will enhance stability of power system operation and electricity losses will be decreased; the mains network will be strengthened; and future emergencies in the capital and east region will be avoided. The link will also enable the country to export surplus electricity to its neighbours during summer period and to import it when needed. The project has been fully executed on the Georgian side and work in Turkey should be finalised in the next few months. Akhaltsikhe substation will be commissioned following this. When complete, the project will involve 292km of power lines, plus the only HVDC station in the Caucasus region. Georgian state companies Electrosystem and Energotrans began work on the project in 2011 with Siemens Austria and Siemens Germany responsible for construction and installation. The contract price for the substation and HVDC station is EUR159 million, with the overall project cost EUR321 million. For its part, Turkey is actively seeking membership of the Electricity Network of Transmission System Operators of Europe (ENTSO-E) which will allow the two countries eventually to export and import electricity throughout the whole of Europe. Honeywell and Opower have introduced new technology that will help utilities attract more homeowners to voluntary programmes that curb the demand for electricity, and help create a stable and effective energy grid without new power plants. The Energy Management Platform drives programme participation by giving homeowners the latest tools to easily balance comfort, convenience and cost. It also merges demand response and energy-efficiency programmes for utilities - traditionally separate activities - to streamline deployment and management, and boost overall results. This is the first technology to provide utilities with both auditable peak and permanent load reduction. According to a 2012 E Source survey of more than half of the demand response programmes in the USA, the average participation rate for residential customers is 13 per cent. Honeywell and Opower expect the new platform to drive rates to at least 20 per cent, a more than 50 per cent increase, due to consumer-friendly features such as mobile access to energy information and control. This would provide an additional 220 MW of peak shed capacity just to the utilities surveyed, equivalent to the output of more than four gas-fired peaking plants. In addition, the platform uses proven measurement techniques to deliver ongoing, verifiable energy savings every day - savings widely accepted by regulatory agencies, which utilities can count toward their annual efficiency goals. The Energy Management Platform combines Honeywell's best-selling Wi-Fi thermostat and Akuacom utility management software with Opower's interactive, cloud-based application to give homeowners the ability to view and adjust energy use from anywhere via smartphone or the Web. The app offers tips and coaching to help increase efficiency and deliver long-term savings. Honeywell and Opower are currently testing the platform in a trial with Pacific Gas and Electric Company (PG&E), one of the largest utilities in the USA, serving customers in northern and central California. As part of the trial, Honeywell and Opower are recruiting participants and installing more than 500 free thermostats to validate energy savings. The goal is to gauge customer acceptance of and experience with the technology. The programme is also intended to confirm the savings that are realistic for customers in PG&E's diverse service area against the hypothesis that the thermostat and app will help save up to five per cent of whole-house electricity and gas use. The trial will conclude in the first quarter of 2014, but PG&E has garnered initial findings, which were published in a recent report. So far, customers find the technology accessible and intuitive, and use it to actively manage comfort and consumption. "As separate efforts, demand response and efficiency programmes can offer significant benefits to utilities and customers, but it's typically been hard to measure and verify their effectiveness," said Alex Kinnier, senior vice president of product management at Opower. "By combining these efforts and providing a way to help utilities generate real, measurable savings, we've created a new, more cost-effective and capable model." Swansea, UK-based S&C Electric Company Europe and Scottish and Southern Energy Power Distribution (SSEPD) have commissioned an innovative new pilot energy storage project in the UK. The pilot employs stored energy from batteries to help mitigate the effects of low carbon devices on the low voltage (LV) network and is in part funded by electricity regulator OFGEM's low carbon networks (LCN) fund. Based at the SSEPD eco-home project Zero Carbon Homes in Slough, the pilot will consist of three single-phase 25kWh lithium-ion batteries connected at a strategic point on the LV network. S&C's PureWave Community Energy Storage (CES) integrates these batteries to the grid enabling them to switch on and off from the grid when required, managing charging and discharging of the batteries. The batteries will be utilised to spread demand and generation loads at different times throughout the day. The batteries can provide real or reactive power to aid with voltage regulation, too. During the pilot project, SSEPD will model and analyse the benefits that energy storage can provide to a LV network. Adding a variety of low carbon technologies such as solar photovoltaic and electric vehicles to the network can necessitate building a bigger network to cope with the demand - ie network reinforcements. However, this can be costly and has associated long lead times. The purpose of the pilot project is to prove that the batteries can perform the same function as a traditional reinforcement and hence there is an economic case for installing energy storage systems.